With Super Bowl approaching it’s time to start planning some game day eats and snacks. Because after all, that’s what is about, right? Food and commercials. Right? Am I missing something? I don’t think so. Oh and bacon. And guacamole. Food, bacon, guacamole, and commercials. I think that covers it. This is a perfect Super Bowl snack because it’s ridiculously easy to make. You don’t want to be slaving away in the kitchen. As a bonus, it will make your house smell like bacon. 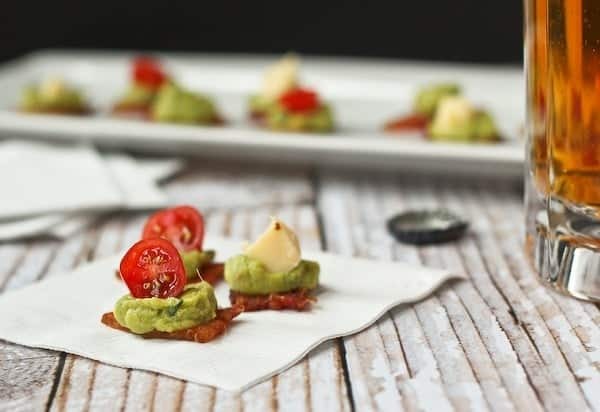 What makes this bacon guacamole appetizer even easier is that I used already prepared guacamole from my friends at Sabra. * I used the classic variety, but if you like it spicier, try their spicy guacamole. Using a great tasting prepared guacamole will take the stress out of this recipe. Goodness knows, living in Michigan, when I slice open an avocado, I never know what I’m going to get. There’s a 50/50 chance it is going to be nasty, brown and stringy inside. Actually more like 80/20. It’s a sad avocado situation here in Michigan. When I open a container of Sabra guac, I know I can confidently move forward with the rest of my recipe. To avoid the bacon cracking or crumbling, I sliced it into bite-sized pieces prior to cooking (remember it will shrink slightly during cooking). I baked it so that it would remain nice and flat, and then I also lined my baking sheet with parchment paper so I wouldn’t lose any precious bacon to a sticky situation with my baking sheet. Then, after removing grease and cooling the bacon slightly, to easily get the guacamole on the bacon pieces, I spooned it from the container into a zip-top sandwich bag. Then I cut a small corner off the bag and just squeezed the guac onto the bacon pieces. For topping, I did some with tomatoes (my favorite), and some with a nice sharp cheddar — both delicious. I left a few plain as well for traditionalists out there. Enjoy! Happy snacking. Oh yeah, and watching football commercials. Line a baking sheet with foil and then with parchment paper. 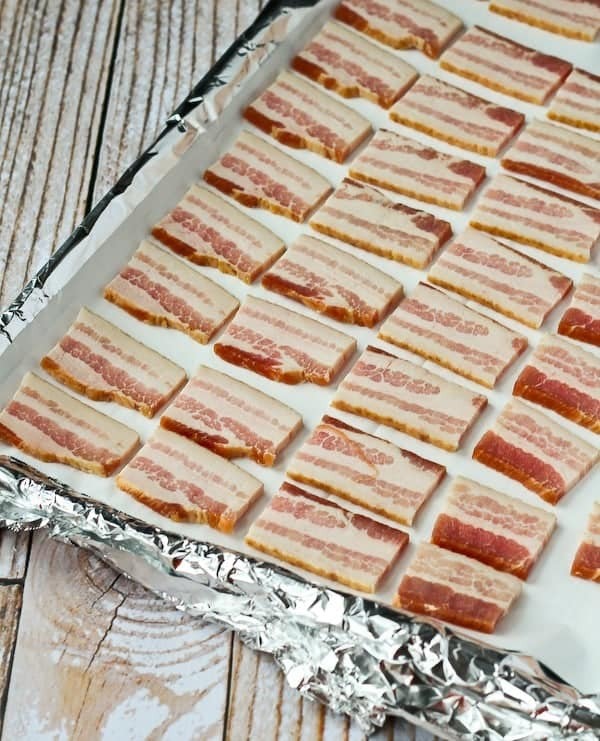 Arrange bacon pieces in a single layer so they are not touching. Put bacon in cold oven and turn on to 400°F. Bake for 28 minutes total or until crispy and browned. Remove and place on a paper towel lined plate. Meanwhile, put Sabra Guacamole in a small zip top bag and cut off a small corner. 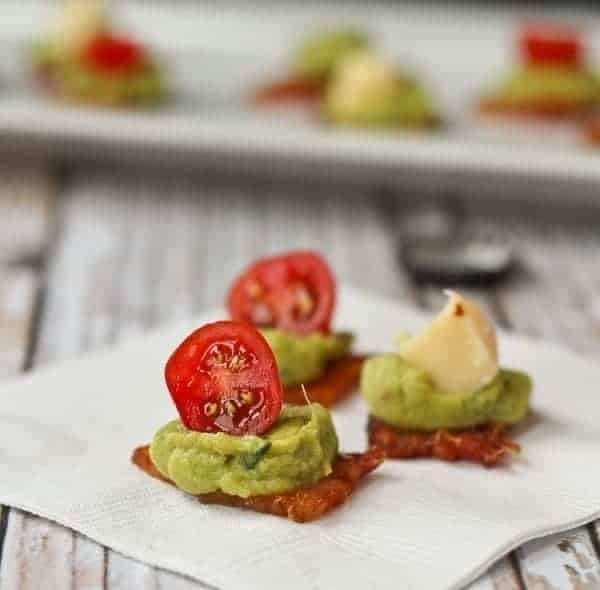 Squeeze a small amount of guacamole on each piece of bacon and top with either a cut grape tomato or a chunk of cheese. Serve immediately. Nutrition for bites topped with tomatoes, not cheese. Verdict: Hello. Bacon, guacamole. Yum, yum. 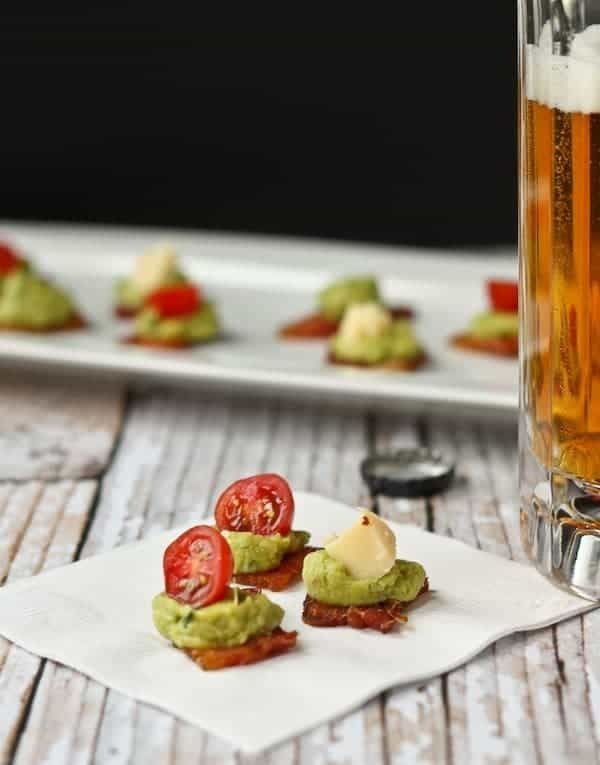 Husband’s take: What dude wouldn’t love a bacon guacamole appetizer? I shared these with the neighbors too and they loved them. 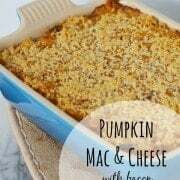 Looking for more game day eats? Try Southwestern Stuffed Mini Sweet Peppers, Sweet and Tangy Baked Beans, Flatbread with Hummus, Veggie and Dip Stuffed Mushrooms, or this super fun Seven Layer Dip Crepe Cake from The Cupcake Project. *Disclosure: I’m honored to have been selected to be a Sabra Tastemaker. I’ve been compensated for my time but all opinions are (as always) my own. Thanks for supporting my blog by reading about products I use and love. USING BACON AS A CRACKER? Seriously, you are a GENIUS. I am obsessed with how easy these are and if you say my house will smell like bacon, well, I’m IN. Pinned! What’s NOT to like about these bite sized treats, Rachel – love everything you’ve got going on here and guarantee I’d eat way too many! Bacon and avocado! I want it all!!!! Dude. You just made my day. Bacon as a tortilla chip…yes, please. 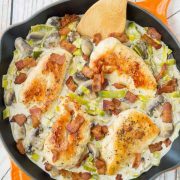 I am all over this appetizer! The bacon base is genius! Love the use of bacon as a cracker! Game day really is just about food and commercials, I totally agree. And this is one appetizer that will absolutely be making my list! I cannot resist it! Rachel I just love this! 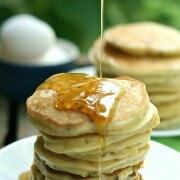 The flavors (mouth.watering.now), the simplicity and the versatility. What a great combo and I love the plastic bag piping tip too! Oh man. I want all 40. I love Sabra. What an awesome app! Bacon and guac? You’re speaking my language, girl. And you just can’t beat Sabra dips of any kind. What a perfect little bite of heaven :) Mmmm!